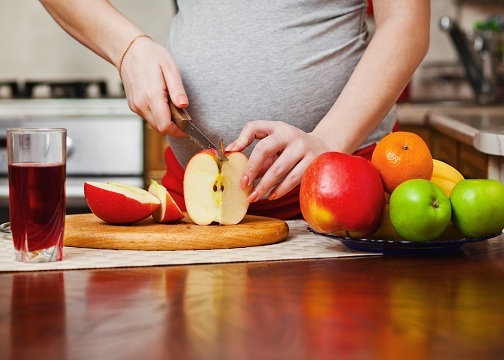 Pregnancy Diet plays an important role in our life and even more important, when you are supporting a life yourself. Dates are considered a healthy snack and have high nutritional value, making it for the most recommended snacking item. Dates have sufficient amount of proteins. Protein helps in repair and growth of muscles and other organs and hence, consuming a few dates in a day can aid your muscle and body repairing process. Vitamin K deficiency is seen in young infants and mothers can prevent that from happening by consuming Vitamin K rich foods. Dates happen to be rich in it and also help in bone development of baby. Brain and spinal cord deformities are commonly observed and folate plays an important role in their growth and development. Dates are rich in folate and is recommended to pregnant mothers for this reason as well. Dates also are rich in potassium which helps in regulating electrolyte balance in body. This can also reduce cramps significantly and maintain ideal blood pressure. Constipation is a common problem faced by pregnant women. Consuming dates is beneficial in that way as well. Dates are very rich in fibre and that helps in bowel movements. If you remain severely constipated, try including dates in your diet. Dates can provide and extra boost of energy, any time you are feeling low or tired. They also contain generous amount of healthy sugar that can instantly elevate your energy levels. Dates are also known to help with uterine contractions during the labour. It eases the pain and aids production of prostaglandin which plays important role in delivering the baby. There are many ways to consume dates if you don’t like them raw. Try replacing refined sugar with dates for a start, add dates to your glass of milk instead of sugar. Blend some dates with yogurt and fruits of your choice and turn it into a smoothie. Include them in your desserts by making a syrup out of dates. You can also have some in your breakfast.